Ganga Singh Museum is considered to be the best in Rajasthan for its treasure trove of artefacts from Harappan and Gupta periods. 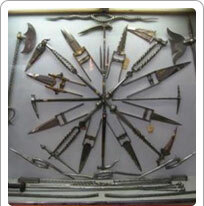 Paintings, terracotta, carpets, pottery, art and crafts, and Rajput weapons are on display. It is open from 10.30 AM to 4.30 PM each day except Fridays and public holidays and has an entry fee of Rs 3.